A hole at the heart of a stunning rose-like interstellar cloud has puzzled astronomers for decades. But new research, led by the University of Leeds, offers an explanation for the discrepancy between the size and age of the Rosetta Nebula's central cavity and that of its central stars. Through computer simulations, astronomers at Leeds and at Keele University have found the formation of the Nebula is likely to be in a thin sheet-like molecular cloud rather than in a spherical or thick disc-like shape, as some photographs may suggest. A thin disc-like structure of the cloud focusing the stellar winds away from the cloud's centre would account for the comparatively small size of the central cavity. 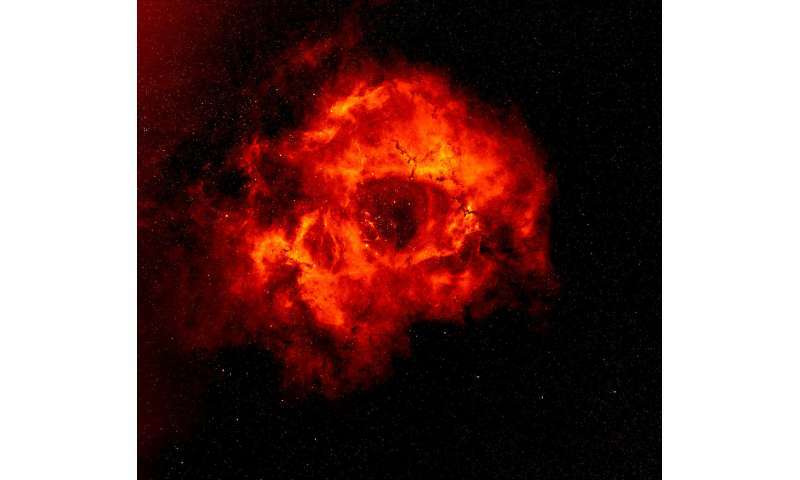 Study lead author, Dr Christopher Wareing, from the School of Physics and Astronomy said: "The massive stars that make up the Rosette Nebula's central cluster are a few millions of years old and halfway through their lifecycle. For the length of time their stellar winds would have been flowing, you would expect a central cavity up to ten times bigger. 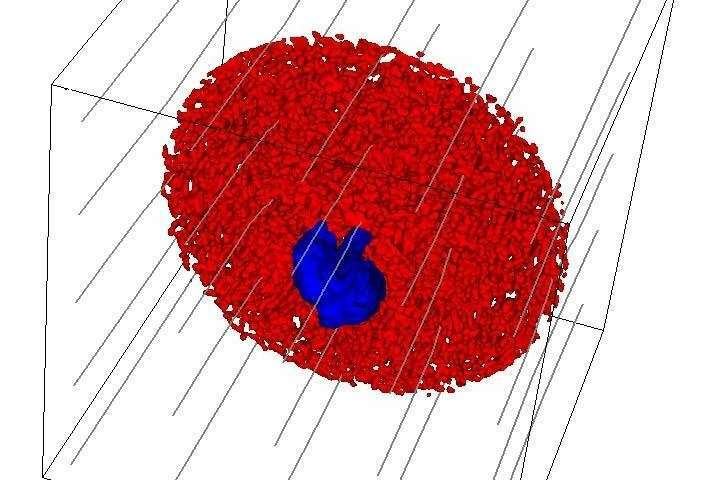 "We simulated the stellar wind feedback and formation of the nebula in various molecular cloud models including a clumpy sphere, a thick filamentary disc and a thin disc, all created from the same low density initial atomic cloud. "It was the thin disc that reproduced the physical appearance - cavity size, shape and magnetic field alignment—of the Nebula, at an age compatible with the central stars and their wind strengths. "To have a model that so accurately reproduces the physical appearance in line with the observational data, without setting out to do this, is rather extraordinary. "We were also fortunate to be able to apply data to our models from the ongoing Gaia survey, as a number of the bright stars in the Rosette Nebula are part of the survey. Applying this data to our models gave us new understanding of the roles individual stars play in the Rosette Nebula. Next we'll look at the many other similar objects in our Galaxy and see if we can figure out their shape as well." The simulations, published today in the Monthly Notices of the Royal Astronomical Society, were run using the Advanced Research Computing centre at Leeds. The nine simulations required roughly half a million CPU hours—the equivalent to 57 years on a standard desktop computer. Martin Callaghan, a member of the Advanced Research Computing team, said: "The fact that the Rosette Nebula simulations would have taken more than five decades to complete on a standard desktop computer is one of the key reasons we provide powerful supercomputing research tools. These tools enabled the simulations of the Rosette Nebula to be done in a matter of a few weeks." The cross sectional diagram showing the solar wind takes on the classic structural shape of a z-pinch indicating the existence of Birkland current. The filamentary structure in Rossete image itself indicates the presence of electrical field lines permeating through the plasma cloud as well..
OOhh can I have a go? To the right on the edge of the formation is the face of a rabid badger. I can clearly see the ear and below that an eye and a mouth with big pointy teeth and a button nose at the end of its muzzle. On the opposite side of the cloud to the badger I can something that could be the offspring of snapping turtle and an orc. Its mouth is wide open and it looks very angry. the scale is difficult to work out. Just below that is the rabbit from Donnie Darko picked out in yellow. It's good this science stuff!